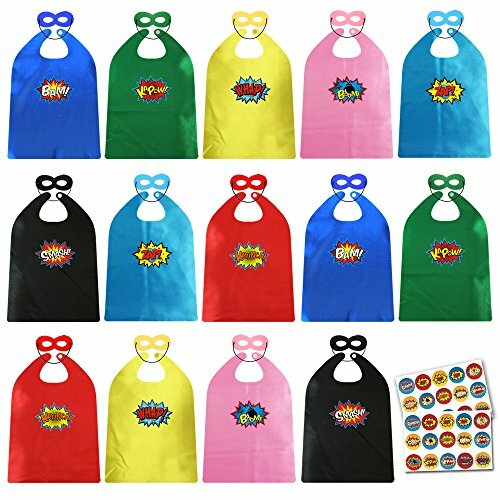 ADJOY Child Super Hero Capes and Masks Bulk Pack with Stickers for Superhero Themed Birthday Party | What Should I Say? ★Are your kids big fans of superheroes? Love pretend play with your little ones? Tired of cheaply made and easily torn apart dress party costumes? If you are nodding,you find right products. ADJOY can provide you the ultimate superhero costume collection for your kids. Being a superhero is every child's fantasy. Make their dreams come true with these fancy little costumes! Draw or print or do anything you can imagine on the capes and masks,Put On, Adjust & Go to save the world¨C Everything is Easy. ★Each set includes 14 sets of Satin superhero costumes, masks. Any great superheroes can be by your side.Bat Super Spider Man, Capital Ameri etc as you want. ★ With high quality satin fabric, vibrant colors and adjustable Velcrro-straps, these dress up costumes accommodate even your most demanding needs. Suitable for Halloween trick-or-treating, role playing, birthday parties, party favors, date plays, superhero theme parties, sleepovers, and any other occasion or pretend play that your little one feels like dressing up as a superhero! Ideal for both boys and girls. With ADJOY Superhero Costumes You Kids Could expand their vocabulary and develop language skills! follow the rules, understand concepts, and build empathy. develop problem solving skills and promote critical thinking, ensure cooperation, team work and harmonious interaction with others! learn what's right or wrong, explore moral values, become patient and helpful! ★Hurry Up to add to cart or you might miss it. If you have any questions about this product by ADJOY, contact us by completing and submitting the form below. If you are looking for a specif part number, please include it with your message.